Summary: Difference Between Virtual Memory and RAM is that Virtual memory is a concept in which the operating system allocates a portion of a storage medium, usually the hard disk, to function as additional RAM. While RAM (random access memory), also called main memory, consists of memory chips that can be read from and written to by the processor and other devices. Virtual memory is a concept in which the operating system allocates a portion of a storage medium, usually the hard disk, to function as additional RAM. As you interact with a program, part of it may be in physical RAM, while the rest of the program is on the hard disk as virtual memory. Because virtual memory is slower than RAM, users may notice the computer slowing down while it uses virtual memory. The operating system uses an area of the hard disk for virtual memory, in which it swaps (exchanges) data, information, and instructions between memory and storage. The technique of swapping items between memory and storage is called paging. When an operating system spends much of its time paging, instead of executing application software, it is said to be thrashing. If application software, such as a Web browser, has stopped responding and the hard disk’s LED blinks repeatedly, the operating system probably is thrashing. Users typically are referring to RAM when discussing computer memory. 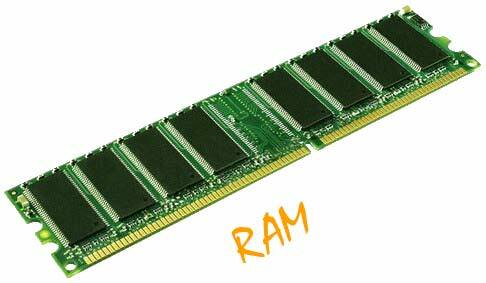 RAM (random access memory), also called main memory, consists of memory chips that can be read from and written to by the processor and other devices. When you turn on power to a computer, certain operating system files (such as the files that determine how the desktop appears) load into RAM from a storage device such as a hard disk. These files remain in RAM as long as the computer has continuous power. As additional programs and data are requested, they also load into RAM from storage. The processor interprets and executes a program’s instructions while the program is in RAM. During this time, the contents of RAM may change. RAM can hold multiple programs simultaneously, provided the computer has enough RAM to accommodate all the programs. Most RAM is volatile, which means it loses its contents when the power is removed from the computer. For this reason, you must save any items you may need in the future. Saving is the process of copying items from RAM to a storage device such as a hard disk.